I had a wonderful Jazz Night Out when I was able to hit two shows on Saturday, February 7th. First up was the release party for The Yeilds, the debut album by Radarhill. As the evening featured a display by two local artists, the party doubled as an art show, so Wild Goose was filled with a large crowd of art fans and friends as well as those there to celebrate the music. The first opener was Triangulus, a trio of Radarhill’s friends from Ohio University, including Radarhill bassist Eli Chambers, who played drums for most of the set. Their music could probably be classified as “post-rock,” mostly instrumental jams (there were occasional wordless vocals by guitarist Turner Matthews) with some jazzy elements, but with a mostly hard-edged rock feel. The moody, often frenzied tunes were a good warmup to get the night started. Next was Small Songs, saxophonist Alex Burgoyne’s (also an OU alum) modern/free jazz group that plays open interpretations of songs written by Burgoyne’s piano students about their pets – quite the unique concept. The band added a few songs and a guitarist (Kyle Tucker) since I saw their debut, and the shifting sound of the group was definitely fuller and more lived in. I didn’t quite recognize “Arlo” when I heard it the second time, and after a quieter portion, the anthemic conclusion, driven by a powerful Burgoyne solo, was an attention-grabbing finale to the set. My first time seeing the new quintet lineup of Radarhill (they recently added trumpeter Nick Simko to the mix) represented an improvement on something I already enjoyed greatly. The band played all five songs from the album, as well as three newer songs that fit in quite well. Opener “Go Thank Yourself,” a new tune by bassist Chambers, served as a strong intro to the hard-charging “Risen, Indeed,” which featured Jordan Reed (on soprano sax) trading lines with Simko, and a pounding solo from keyboardist Caleb Miller over a funky backdrop provided by the rhythm section. “200 Million Horsemen,” a new tune by Reed that he wrote for one of his OSU DMA classes, opened with abrasive parts from the horns and kept chugging with a bombastic pulse. The final trio of tunes were even more forceful and dramatic than the earlier part of the set – the party lines from the horns on “Lanes Merge” preceded great solos by Chambers and drummer Troy Kunkler, and the heavy dramatics of “Anteater” set the stage for the climax of “I Could Float Here, Forever.” The musicians played off of each other and the sound swelled in unison, then delved into serious solos from Reed (on alto) and Chambers, before they swung into the theatrical final movement of the tune, ending the set at its most thrilling point. I know it’s early, but I predict that set will be hard to top for my favorite of 2015. Great party for a great album! The energy from the release party powered me down to Brothers Drake to catch some of the Rad Trads’ Gallery Hop show. The visiting party band had packed the place with revelers, which was great to see. The band has been working on adding original tunes to their repertoire of some of America’s greatest party standards, and the results appear to be strong so far. Songs like “Let The Pressure Out Of Me” and “Atlantic, Capitol, Keith Richards and I” fit in pretty well, putting the swagger of the band into a bluesy, roadhouse stomp. Of course, their arrangements of classics and pop songs still got the biggest rise out of the crowd, like Rebirth Brass Band’s “Feel Like Funkin’ It Up” and a fun take on Lorde’s “Royals.” The Rad Trads are spreading their wings, but the focus is still on a time-honored musical party. Saturday, February 14th: Jerry Powell Trio at Sidebar Columbus. As you can see on our calendar, there are a variety of ways you can celebrate this Valentine’s Day with some swing. One of the best options looks to be the return of jazz to this downtown bar that once hosted weekly performances but has not featured jazz in some time. Drummer Powell, busy throughout the region including regular gigs in Detroit, will play with his trio of fellow up-and-comers, pianist Robert Mason and bassist John Allen. Allen told me that the night will feature a mix that includes some soul tunes and some Latin numbers, so this should be a varied performance. Come out for a great show in one of the better jazz rooms in town that will hopefully be hosting regular shows again soon. Sunday, February 15th (3-4pm): OSU Jazz Lab Ensemble with Don Hales at the Weigel Hall Auditorium (OSU Campus). This student ensemble, under the direction of Kris Keith, will present a program of big band jazz that will include a special guest appearance by guitarist Don Hales. Music for the one hour program will include tunes by Charles Mingus and Oliver Nelson, arrangements of jazz standards “You’d Be Oh So Nice To Come Home To” and “Like Someone in Love,” and “Seaweed Song,” a Hales original that was featured on his 2006 Unified String Theory album with organ titan Tony Monaco. This show is free and open to all ages, so it will be a great way to experience some top notch college jazz. Tuesday, February 17th: Jonathan Scales Fourchestra with Rorschach Quartet at Scarlet & Grey Cafe. Scales is a master of the steel pans, and he put his well-honed skills on display during a great Friday afternoon performance at the 2014 Jazz & Ribs Fest. 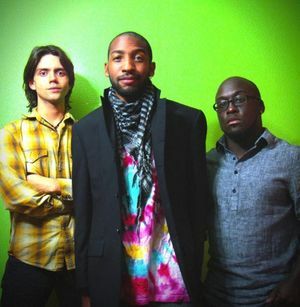 His trio, which currently entails bassist Cody Wright and drummer Chaisaray Schenck, will bring their wide-ranging groove to the campus area on this tour stop that happens to fall on Mardi Gras. Local group Rorschach Quartet will start the show at 9pm with their diverse material that features inventive arrangements of popular songs that you wouldn’t normally hear at a jazz show, so make sure to get there early.